As it happened, I watched two versions of Les Misérables for each of my film classes. The first was by choice, as I wanted to watch some leftist poetic realists films in order to provide context for the later resistance films. The latter was for religion in film, to show how symbols were used to convey religious meanings. The candles were the objects that we focused on the most, as they represented his second chance, and tied him toward his messianic destiny. Raymond Bernard, who was Jewish and would have to cease filmmaking and flee during the war, produced some popular early films that established class as a major theme. The work he is most remembered for is his adaptation of Les Misérables. At a running time of over 5 hours, it was the most detailed adaptation of Victor Hugo’s 1862 novel. Bernard uses Hugo’s characters from the early 19th century to highlight the class struggles of the 1930s. With Jean Valjean’s arc from criminal to the aristocracy, he does not lose sight and empathy for those less fortunate, hence his adoption of Cosette after feeling somewhat responsible for her mother’s death. Bernard’s film develops Marius Pontmercy whose rebellious spirit is contrasted with his father’s loyalism to the royalty. The events culminate in the 1832 June Rebellion, but Bernard’s classist portrayal is reminiscent of the post-Bolshevik political reality in Europe. Bernard’s version is undoubtedly the most accomplished of the two. While the major brush strokes of Valjean’s character are the same, Bernard is able to highlight the subtleties through performance. The conflict with Javert, portrayed as strict good versus evil in the musical, is more complicated in Bernard’s version. Javert has a code, and both versions are obsessed with their pursuit of Valjean. It is with the resolution where the characters divert. 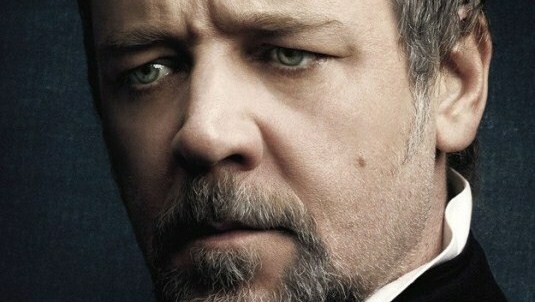 Since Russell Crowe’s Javert is the absolute face of evil, there is a catharsis in his suicide. He was getting his just desserts. The french Javert was eventually able to see the morality within Valjean, and his departure from the screen is far more effective as a character destination. Again, the focus was on subtle actions rather than grandiose theatrics. Tom Hooper can now call himself an Oscar winner for The King’s Speech, but he has yet to remind me that he is even an adequate director. His best film in my opinion was The Damned United, although I think that is mostly thanks to some interesting source material and characters. I noticed his poor direction in The King’s Speech. It’s mostly lazy. Rather than set the scene and let the characters breathe, he smothers them with the camera. Close-ups are fine if they serve a purpose. Sergio Leone, Jean-Pierre Melville, Francois Truffault have iconic close-ups that reveal deep emotion. Hooper reveals nothing. He was bailed out by some stellar acting in King’s Speech, but was completely exposed when directing the musical. Hooper hammers you over the head with everything. As a musical, you have to expect bombast, but there are limits. Let’s also not forget that poor casting can ruin a movie. Everyone who saw Russell Crowe here, or Richard Gere in Chicago understands. Even Pontmercy seems to sing in the incorrect key for his role, but he at least has chops. Raymond Bernard’s tale is 5 hours, while Tom Hooper’s is 2:30. Because of all the excessive music, the actual narrative and character content is more like under two hours. Bernard had the luxury of a large canvas, something that wouldn’t be possibly today, but he also had a firm understanding and appreciation of the source material that shows on the screen. He could have made an excellent 2:30 movie if that were hi limit. If you haven’t seen it, I highly recommend checking out the Raymond Bernard version. There is a Criterion Eclipse version for relatively cheap, and it can be streamed on Hulu Plus. I hear there is a new restoration making the rounds, which hopefully will find its way to DVD soon. Unless you’re a musical and broadway enthusiast, avoid the Tom Hooper version. Even if you loved the stage production, don’t expect to love the film. Posted on May 3, 2014, in Film and tagged anne hathaway, les miserables, raymond bernard, russell crowe. Bookmark the permalink. Leave a comment.